Home › resource management › Workforce planning tools for Engineering services – How can they help? Managing multiple projects with a limited workforce is challenging in many industry sectors. Workforce planning tools have a large role to play as organizations strive to optimize the utilization of their staff, whilst ensuring that individual project commitments will be met. Within engineering services, most projects are for external clients and some can be quite large. Their workforce planning issues differ significantly from internal departments, such as IT, where projects are generally for other departments and priority is based on their relative strategic importance. For new internal projects there may be little chance of hiring additional staff, so lower priority ones may need to be delayed to free up resource. So how can workforce planning tools best be used in engineering services? Managing client expectations is paramount and there must be sufficient resource available, with the required skills and experience, for each commitment to be met. As new projects get awarded, their workforce demand must be accommodated without affecting other commitments. This can lead to the routine hiring of contract staff for new projects. Most client projects require a detailed project estimate. Project templates based on estimating metrics help to improve estimating accuracy. 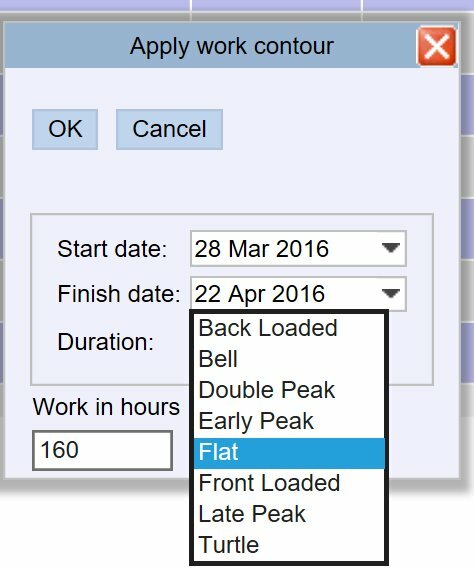 Use of standard profiles to distribute work totals over time speeds up the estimate preparation. Forward loading reports locate workforce skill bottlenecks and any under use, in all corners of the organization. As individual proposals get close to being awarded, the workforce implications are highlighted so that any recruitment or contractor requirements become clearly visible. ‘What If….’ scenarios can be used to minimize the impact, whilst respecting each project’s committed dates. Project managers may want to specify particular skills and certification requirements when requesting staff. Team leaders will need to know each member’s skills and commitments if they are to match each workforce request, and maintain high levels of utilization for their team. There must be effective collaboration between project and resource managers if individual projects are not to suffer. Regular measurement of each project’s performance gives early warning if corrective action is needed. As each project progresses, details of the actual effort spent (from timesheets) and the value of the work achieved (earned value) must be recorded. Any variance with the agreed plan (the baseline) should trigger a re-estimate if confidence in the project is to be maintained. Changes in scope of the project should also trigger a review of the project baseline; it is the yardstick for measuring project performance, so its accuracy must be maintained. Improvements to these 4 areas will significantly improve staff utilization levels, whilst meeting each project’s delivery commitments. Workforce planning tools enable engineering services firms to achieve this strategic goal.